BARE HILLS/LAKE ROLAND PARK – Promote policies outlined in the Community Plan as they relate to this area. COMMUNITY ENHANCEMENTS/HISTORIC PRESERVATION – Identify and pursue community beautification and revitalization projects and funding. Continually monitor the community for opportunities for improvement. Sponsor educational/preservation projects. Address issues contained in Historic Preservation section of Community Plan. EVENTS – Coordinate RRLRAIA-sponsored events. 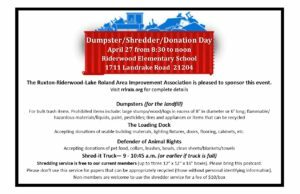 These events include Dumpster Day, Shredder Day, Holiday Party in the Woods, Friday Night Lights, Annual Membership Meeting and annual stream cleanup and quarterly roadside cleanups. This committee also coordinates offsite Board meetings that are held once or twice a year. 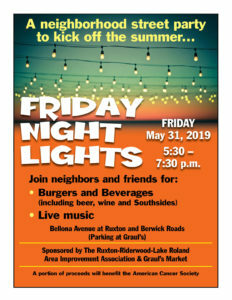 Future events may include a meeting on various aspects of historic preservation and/or a Lake Roland Park event sponsored with the Lake Roland Nature Council. MEMBERSHIP/DIRECTORY – Build and maintain viable, active paid membership of residents, businesses and institutions in community. Develop/distribute welcome package for new residents. NEWSLETTER/WEBSITE – Write and/or solicit articles, take photographs, and assist with editing the newsletter which is published three times each year. Committee meets as a group three times a year to plan the upcoming issue. There is then a two-month period with deadlines for each stage – writing, editing, layout, printing and mailing. Maintain and/or assist with the maintenance of website using WordPress. NOMINATING – Create an annual slate of board members and officers; present list of potential candidates when vacancy occurs on the Board. TRAFFIC/ROADS/TRAILS/LIGHT RAIL – Serve as clearinghouse for traffic, road, trail and light rail issues. Monitor existing/potential problems with traffic patterns, intersections, road conditions, bridge improvements, and traffic hazards. Develop community awareness about speeding, cut-through traffic and other traffic-related problems. ZONING/DEVELOPMENT – Monitor, oversee, and coordinate efforts relating to zoning issues (variances, special exceptions, comprehensive zoning, Design Review Panel).